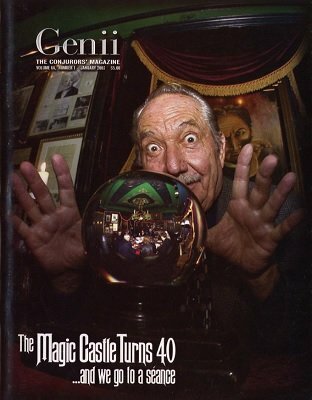 The House That Milt Built - The Story of the Magic Castle - Bill Larsen, Jr.
Is Every Magician Becoming a Content Provider? Can This Be Applied to Card Tricks? Board-Book Game for the Bored? Another Title for the Todd Robbins Book Club? Magician at Large - K.L. The Digital Gen - 4 CD-ROMs - Martin Breese Digital Ltd.
What's Wrong With Women's Magic? Phantoms of the Card Table - David Britland & "Gazzo"
Where Are Our Historians of Stand-Up Magic? Literature As Illusion - Jeffrey Deaver Reveals the Secrets of "The Vanished Man"
Jeffrey Deaver on the Art of Writing Thrillers and "The Vanished Man"
Cover - Thomas Solomon - Escape! Possessed by a Certain Chaos? About the Structure of a "Card Study"
The Center Deal: Fact or Fiction?